Whenever I am in Glasgow I always manage to miss the exhibitions at Mary Mary so was happy, last week, to finally catch Alan Reid's An Absent Monument and what a show to start with! 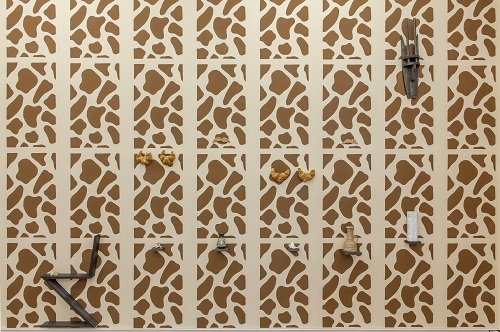 A 20-metre screen-printed mural entitled La Notte (1961) covers three walls of the gallery with a delicious chocolate brown Giraffe-spot pattern overlaid with various suggestive objects - upside and upside-down croissants, vases, wooden moustaches, tea sets, shells and telephones. 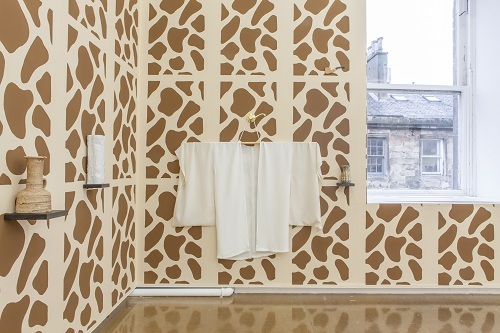 The Giraffe print is part wallpaper, part surface or stage-set for the objects but also a character in its own right - the endless neck of an animal described rather nicely in the gallery text as an 'unfortunate candidate for camouflage'. I expect of one of the columns to suddenly materialise from its hiding place with an enormous blinking googly eye sticker and a purpely-pink tongue to slurp up the baked-goods from the wall. Délicieux! The exhibition is a break away from Reid's usual work which have in the past always centred on a female protagonist. Here we see perhaps her vacated domestic environment, her studio or a set in which she had been performing. 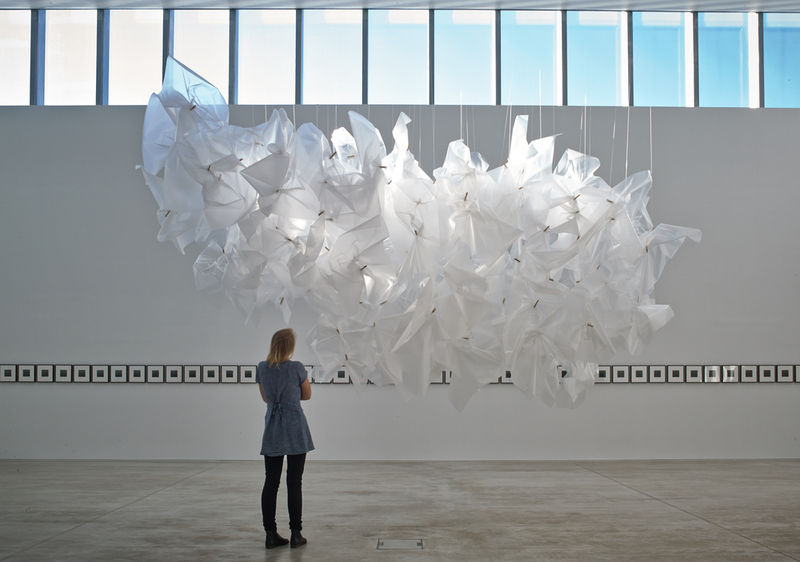 Clothing, commissioned especially for this exhibition from fashion designer Moire Conroy, is hung and strung about. An embroidered black bra hangs from a lampshade type object which in turn is supported by a zebra-Tudor-pop painted plank of wood à la Richard Wood's and his kitchified architectures. Other items have a less boudoirian feel - the white kimono is almost ceremonial, not quite religious but spiritual. They transform the room into something like a Japanese Chashitsu - a cut canvas kettle floats along the wall with the musical f symbol for Forte, LOUDER, except here two of the symbols face each other to cancel the other out. 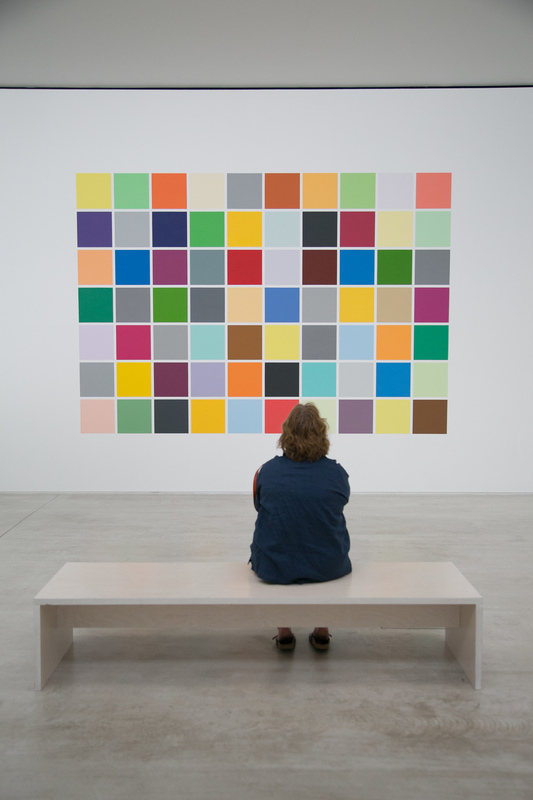 Alongside La Notte (1961), several of Reid's paintings appear, taking the theme of the 'absent subject' as a conceptual starting point. All use silhouettes of Henry Moore sculptures and act as non-functioning clocks. They have a loose drawn quality to them and the colours are a pleasing mixture of subdued blues and greens paired with bold and bodily reds, purples and oranges. Parthenon (2014) in acrylic has the numbers on the absent clock-face replaced with classic film-makers - Hitchcock, Goddard, Kurosawa. The dials point to show the time is forever, in this exhibition at least, about four minutes to Rohmer, or perhaps Truffaut past Goddard. Elsewhere it shows green maple leaf past maple (Perfume Lingers, 2014). Wooden veneer hands point to ripped sugar paper-like painted shapes (Park Bench Newspaper, 2014) . Opposite a stained poplar telephone has the ends of its earpiece replaced by Murex and Nutmeg shells - a stumpy surrealist Majorette baton, it waits for someone to ring as the clocks tick silently. There is a persistent muteness of colour and atmosphere that pervades An Absent Monument which in turn effects the viewer with an abstracted absorption. There is a sense of frustrated anticipation - like marking off the minutes on a Thursday afternoon in the office. Reid uses his colours cleverly to play with our emotions - the watercoloury pencil shades, the bold whack of printed chocolate. I felt calm and satisfied when I left the gallery but also relieved as if i had escaped something - happy enough to be out in the air, into the fun fair, past Nando's and into the noise of the streets. Originally from Texas, Reid now lives and works in New York City. 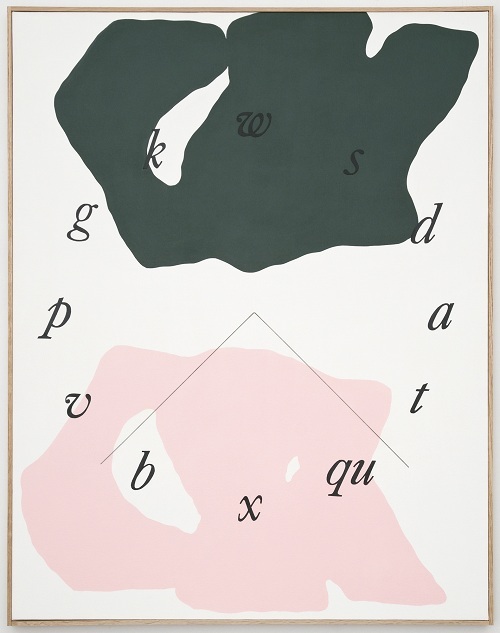 Reid will show a selection of works with Mary Mary alongside gerda Scheeps at Miart, Milan in March 2014. An Absent Monument runs until 15 March 2014.